Like his predecessors, Abdel Fattah el-Sisi is reverting to the twin strategy of use of economic liberalization and coercion against religious extremism as devices to delay democratisation in Egypt. The report argues that past experience indicates that neither economic prosperity nor stability will result from this old strategy. On the whole, it concludes that el-Sisi’s Egypt is sliding back into use of and dependence on autocratic management of politics and economics. The significance of the Egyptian government’s latest bold decision of cutting energy subsidies goes beyond the contested economic short-term impact on the future of democratisation and stability in Egypt. Though the rolling back of subsidies might be applauded by Egypt’s donors and international financial institutions, without a coherent economic vision, serious institutional reform and forthright anti-corruption drive, it is doubtful whether this strategy would succeed. What is certain is that its impact will only exacerbate the already poor conditions for millions of Egyptians and fuel the public discontent among wider sectors of society. Mubarak has used economic liberalization and war against religious extremism as excuses to delay democratisation. Decades later, Egypt achieved neither economic prosperity nor stability. El-Sisi’s use of the same failed strategies of trading uncertain economic growth for democracy and human right is unlikely to improve political and economic conditions in Egypt. It is no secret that el-Sisi has never promised to deliver democracy to Egypt, not before 25 years at least, as he himself declared during the election campaign. (2) Until now, el-Sisi’s economic vision is not clear, and with no written economic platform that illustrates and documents his economic perspectives, one has to rely on media interviews and reports of closed meetings that transpire to public. El-Sisi believes that democracy will come to Egypt only when the country’s GDP reaches $5 trillion U.S. dollars (Egypt’s GDP was $271 billion in 2013); (3) the economy will grow if workers just work harder; investments will come if businessmen give to the country, by exhibiting sincere motivations; and the economy will be stimulated if international donors provide aid ‘unconditionally’. This vision is flawed economically and is politically detached from reality. Besides fiscal reform, el-Sisi does not seem to see the urgent need for fighting corruption and undertaking massive institutional reform. This is essential for good governance measures, political accountability, rule of law, and inclusive democracy—all policies that el-Sisi is overlooking. A robust economic success is almost impossible in the absence of transparency, participation, and shared data, plans and policies, even under the pretext of “national security secret,” as Sisi once classified these national projects. (6) Even authoritarian regimes need minimum levels of transparency for generating public support and enabling accountability for public projects. El-Sisi addressed Egyptians after the last price increases, asking them to be patient as the country is in a “state of war inside, and outside.” (7) The lack of participatory democratic institutions and the non-inclusive approach for decision making and for setting the economic priorities will neither help the current regime stabilize its rule nor achieve satisfactory economic success for the majority of Egyptians. Throughout his media interviews and meetings, el-Sisi’s economic discourse revolved around three axioms: hard work, sacrifice, and international support to lift the Egyptian economy out of its current turmoil. In addition to its vagueness and lack of visionary framework, the proposed policies are simplistic, overemphasising quantity over quality, and missing any potential for sustainable economic reform. El-Sisi’s conception of hard work is that public servants should start work at 7:00 a.m. Again, he fails to make reference to any logistical complications, the substance of work needed, or the absence of positive incentives for workers such as fair wages and decent work conditions. (8) He seems focused on the workers’ responsibility and neglects the business owners’ responsibility. He reveals his views on this issue by saying, “People are striking for salary raises and are not working. This is not a problem; they can suit themselves and not work. We have others who can fill in, but without one cent increase.” (9) This reflects a deep disregard for workers’ rights and demands and a lack of appreciation for their difficult financial and living conditions that they have endured for many decades. In all of el-Sisi’s interviews, there is no mention of the sources of funds needed for his economic plans, aside from the international support from Gulf States (which now exceeds $20 billion) and the International Monetary Fund (IMF). He has recently announced that “one of the Gulf countries has been supplying Egypt with $900 million monthly, and this cannot go on for long.” (14) It was announced that the Gulf countries, with the help of some European countries, are planning to hold a donor conference to support the Egyptian economy. (15) Contrary to his verbal acknowledgment, however, el-Sisi’s concrete steps to make the Egyptian business environment conducive to local and international investment are absent. Economic reform and liberalisation have been used as pretexts for military dictatorship like in Pinochet’s Chile, Suharto’s Indonesia, and in Ben Ali’s Tunisia. However, it should be remembered that Egypt has already been liberalising its economy since the 1970s when it opened the economy to foreign investment, relaxed interest and exchange rates, privatised the public sector to a great extent, freed prices, and floated the pound. Still, Egypt needs urgent and radical economic reform. The question, however, is what kind of reforms does Egypt need the most? The most critical ones are fighting corruption, shoring up state capacity and enhancing the competitiveness of the economy in order to create sustainable jobs to absorb the high unemployment levels. Deepening and institutionalizing the reforms necessitates introducing progressive taxes in order to fund educational and health systems that both support the growth and social justice. Contrary to what is urgently needed, the current government deprioritizes institutional reform and fighting corruption. In a television interview prior to his election, el-Sisi said, “Be gentle in your criticism of officials, they are humans and have families. Give them four months before judging them, and instead of defamation, just whisper to his [the official] ears.” (16) In support of this position, el-Sisi reiterated the same views in another meeting with party leaders: “The state consists of institutions. These are cornerstones. The judiciary is a cornerstone, so are the interior ministry and the media. The army is the pillar and backbone of the state. Any reference to cleansing or restructuring these institutions hurts, weakens and dismantles them. It disintegrates the entire state. These things we will never do in order to protect these institutions and protect the entity of the state.” This impunity extends to the military as he said: “The army is a beautiful and respected institution. Nothing called oversight over the military. This kind of talk hurts it.” (17) El-Sisi’s position as the ‘custodian of the state’ institutions is not expected to allow him to change them if he wants to pursue tangible reforms to eliminate corruption or red tape, especially with regard to the military. His expectations from the military go beyond merely doing business as usual. Having allocated additional funds to military spending by 28 percent immediately upon coming to power and the retirement pension of military personnel by 10 percent, he expects the military to lead development and to back him and the government in critical moments. In the long run, el-Sisi capitalises on the military’s reputation of discipline and getting things done to justify the military’s encroachment into civilian business domains and civilian public space. Since July 2013, military companies have received contracts for more than 10 billion Egyptian pounds ($1.4 Billion) in various economic ventures. (18) In the short run, the military is backing the government by absorbing gaps that resulted from worker strikes or other shortages. In the aftermath of rising gas prices, for example, the military announced that its buses would substitute private means of transportation and that it would supply the market with huge quantities of affordable food staples. (19) While the country might appreciate the military’s short-term emergency interventions, long-term interference will not be cherished as much. Negative strategic ramifications are expected, including crowding out of civilian business, depriving the national budget of tax resources (because military business is tax-exempt), and fostering further corruption and unaccountability in both civilian and military business. For an angry public that has been waiting a long time for fruitful reforms, following the same painful austerity measures without significant changes in economic policies to address structural dilemmas within the Egyptian economy is not likely to bring either growth or stability. Since July 2013, el-Sisi has been a key, if not the key, player in the Egyptian political scene. He banned the Muslim Brotherhood, rounded up its leaders along with the revolutionary youth, undermined the political parties, and allowed the media to create an atmosphere of a personality cult around him. All was done in the name of averting civil war and restoring the state, which in fact no longer functions as a rational, non-partisan and non-ideological entity but rests mainly on coercive institutions, such as the security apparatus and the military, aided by the judiciary and the media. Egypt is increasingly becoming ungovernable and fragile according to the 2014 Fragile States Index where it ranked the country at 31 amongst 177 countries (the closer to the top the closer to failure). (20) Such authoritarian tendencies make it difficult for a healthy and competitive polity to emerge. With el-Sisi’s polarizing discourse and fear-building repressive measures, it is hard to reach a consensus or achieve stability. His disregard for lawmaking and representative institutions, like the parliament, will further shrink his support base and discourage investors. He might keep himself afloat through the institutions of coercion and through regional support and the international complicity, but this situation might not be sustainable for long. On several occasions, el-Sisi expressed disrespect for political institutions and the democratic process. This will likely hinder his ability to achieve the social consensus necessary for political stability, domestic and foreign investment, and economic development. Prior to the election, when party leaders inquired about his program and plans once he gets elected, el-Sisi exclaimed, “What elections! The people want me. I didn’t want to be here. I am not expecting victory or defeat. We have already started working.” He then gave examples of infrastructural projects that he had already been working on and had assigned the army to implement. In the same vein, Sisi admitted to political parties leaders that he was “not going to wait for a parliament. People will not wait for me until a parliament is elected. I will work before a parliament is in place.” And indeed he did. One of his earliest decrees upon becoming president was to form a “Supreme Committee for Legislative Reform” that is headed by the prime minister and consists of ministers, judges, and legal experts to suggest laws. (22) It is worth noting that under Adly Mansour, the interim president who el-Sisi appointed managed to issue 28 laws. In the last two days of Mansour’s term, six of these were issued. (23) With such an upper-handed and personalistic style of rule, the parliament is expected to be a “rubber stamping” institution primary function of which is to pass laws for the president and his government. El-Sisi will subordinate parliament’s role to legislating on-demand and not monitoring his powers or exercising necessary oversight of the government. In his meeting with party leaders, el-Sisi stunned them by raising the following question: “Why are you so many and why don’t you think seriously of merging in two or three parties and we all work together?” He directed this question to a wide variety of “loyalist” parties (around 12 parties) that run the full gamut of liberal, right of center religious, Salafis, leftist, and pro-Mubarak tendencies. Naturally, these parties do not share a common ideological orientation or similar interests. But the question in itself is revealing. It reflects el-Sisi’s limited understanding of the concept of pluralism and his negative view of the need for political parties. It also underscores his lack of appreciation for the role of parties as representative of competing interests in society and as serious opposition to the government. It also shows his peculiar understanding of “inclusiveness,” as he expects all political parties to merge and work together with the government. Remarkably, this “organic” view is reminiscent, if not of authoritarianism, at least of a by-gone corporatist mentality. Focusing on austerity measures while ignoring the need for inclusive and inspiring economic vision, conducting necessary institutional reforms, and fighting corruption is missing the fundamental component that has been long overlooked since Egypt pursued market and economic reforms in the early 1970s. With such centralised control over policymaking in reshaping the social contract between the state and society, not only the poor will be ignored, but the middle class will also be negatively affected, thus breaking the terms of the social contract that Egypt has had since it became a republic over six decades ago. The resentment resulting from disempowering the middle class may not lead to another uprising in the near future in the absence of massive mobilisation and severe state suppression. Until a critical mass forms, the more likely outcome is that the hard-pressed, marginalized majority of Egyptians would engage in silent civil obedience that furthers state fragility and instability. With an unclear, if not outdated, economic vision, shrinking social support base, (25) and personalistic style of rule, one must ask the question: is it worth Egyptians losing democracy and human rights for unlikely economic success? As for international supporters of the regime: is it worth compromising the rule of law and fundamental democratic values for short-term stability and unguaranteed security? Sustainable development cannot be achieved without inclusive democracy, rule of law, and meaningful reforms. Even if el-Sisi succeeded, his policies might generate growth, but not balanced development. Ignoring poverty and unemployment, alienating youth, overlooking the parliament, and disrespecting the political process will lead to neither market reforms nor democracy. 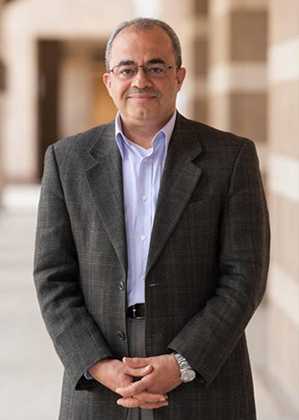 Emad El-Din Shahin is Visiting Professor at Georgetown University. 1- Omar El-Shenety, June 28, 2014. “An Era of Neo-liberal Militarism…Likely,”Al-Shorouq. Neo-liberalism has been a driving force behind economic globalization and integration into the world economy. It rests on the belief in free market and trade, privatization, individual responsibility, de-regulation, and reduction in government spending. Militarism refers to increased military role and presence in political and economic life through controlling public resources and decision making process. 2- Maggie Michael, 8 May 2014, “Egypt’s El-Sisi Tells Media not to Push Freedoms, “Associated Press. 3- On May 19th, Abdel Fattah el-Sisi met with the leaders and representatives of main Egyptian political parties that have expressed support to him. During this meeting, General el-Sisi addressed a broad range of issues that revealed his thinking, orientation and style of rule. In this meeting he explained, “If you want democracy and human rights like America, we have to look at their GNP and the number of their population. Their GNP is 15T and population is 300 million. Your GNP is 300 million and population is 90 million. This means that we can have democracy and human rights when our GNP becomes one third of America’s. When you achieve that GNP, I am willing to give you democracy and human rights.” Author’s interview with one of the attendants of the meeting. [clearer reference is needed by indicating date, place of interview – interviewee’s name can remain anonymous] Author: I would rather not reveal more information on this interview for obvious reasons. Once I indicate the place and the date, the name of the interviewee will become know. 8- His initiative brought fierce debate between the doctors’ syndicate and the minister of health when the latter announced that public hospitals would receive patients starting from 7 am. After clashes between patients who believed the minster and the doctors who refused to start at 7:00, the syndicate warned the minster of expulsion from the syndicate if he didn’t announce that the normal work hours start from 8:00 am. Unquestionably, the minster complied with the syndicate’s demands, leaving el-Sisi’s suggestion in limbo. 9- El-Sisi’s May 19th meeting with the party leaders. 15- Many experts view the decision to roll back subsidies and increase the price of electricity as a way to facilitate the inflow of outside assistance and regain international confidence in Egypt’s economy. 17- El-Sisi’s meeting with party leaders, May 19, 2014. 20- Fragile State Index, “Egypt” Fund for Peace Foundation. 21- El-Sisi’s meeting with party leaders, May 19, 2014. 22- El-Sisi’s meeting May 19, 2014. 23- Nancy Messieh, , “One Year Later: Legislation Issued since Morsi’s Ouster,” The Atlantic Council, July 3, 2014.